I was contacted recently by a member of a traditional Carmelite community of nuns who wanted to make people aware of their community so that any who might be interested could support them. As you can see from the photos below, they have made a great start in their project of building a monastery in the spirit of St Theresa of Avila herself. Nevertheless, they could still do with prayers and financial support. For those who wish to know more, and perhaps even donate, you can do so through their website, FairfieldCarmelites.org. We celebrate Holy Mass and the Divine Office in Latin, using the rubrics and texts pre Novus Ordo; generally those of the 1962 Extraordinary Form. We have sung-Masses with incense on Sundays and other feasts regulated by our ancient Carmelite ritual books. We chant all the Hours of the Divine Office including Matins each day, but (except on feast days) this is done recto tono. We sing polyphony pieces and hymns during Holy Mass on feast days. On other days we attend Holy Mass in silence. Their convent is modeled after St. Teresa's original plans in Avila, Spain. Here are the architect's drawings and some photos of the buildings taking shape. I asked one of their nuns about their aims for the monastery and also about Carmelite life. First of all, what style is the monastery? In the 1500’s, Our Holy Mother St. Teresa of Avila would take the large haciendas, and country and city homes of the time and join them together to form her first monasteries; she would also ensure large garden spaces and build an encircling wall. Our style choice was instinctively informed by this. Ten years ago, when the idea of building a new monastery took flight, I spoke to Mother about the style it was going to be and said it should just be a simple Pennsylvania stone farmhouse behind a chapel. This concept has remained constant up until this day: taking what is natural and fits with this area, acknowledging the wisdom of our forefathers who originally settled this land. It is a farmhouse complex made up of several smaller buildings connected by “covered cloisters”. 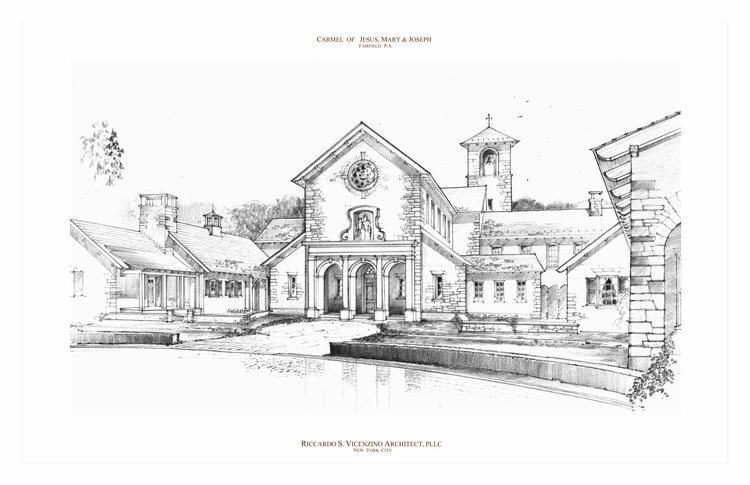 Like Saint Teresa envisioned, this monastery will be a “micro village” - a Church at the center, with living quarters and workshops surrounding it. The chapel facade is modeled after San Jose’s chapel in Avila. It is being built with large, rough cut heavy timbers, plain plaster walls washed with a milk/lime paint, brick floors, open fireplaces, as well as wood stoves, candle and lamplight, and hand pumps at the sink. No central heating, A/C or electricity, cooking with wood, shutters on single-pane windows. The Chapel will with a marble altar, stained glass, and small pipe organ - the sanctuary being the jewel set in the rough. Of course, the stone is on the outside with slate roofs, big chimneys, and a 40’ bell tower. All the rooms/spaces are specifically geared to the monastic life. The Choir is behind a double grill adjacent to the sanctuary. There is the Chapter Room, Refectory, individual cells, and a Novitiate. Basically, we are striving to build how a farmer might have two hundred years ago, but not what he built - essentially using the PA stone farmhouse language to speak a 15th-century Spanish text. Can you tell me something about the Carmelite charism and spirituality? Discalced Carmelite life is centered around interior, silent prayer along with a definite strong note of the eremetical. Both these characteristics distinguish it from the monastic forms, such as Benedictines, who center their spiritually on the Divine Office. Some things that result from this would be: two hours of mental prayer in silence in the Choir before the tabernacle (but not - except very occasionally - before the exposed Blessed Sacrament); the only occasional sung Mass; and only on some days certain Hours of the Divine Office are chanted in Gregorian chant. The Nuns are very strictly enclosed, behind grills, walls, and a turn, but also within the monastery each sister must work alone in her cell or an office and keep strict silence during the day. On the other hand, there is an intense family atmosphere with two full hours of recreation, one after dinner and one after supper. Very few religious houses have this amount of time set aside each day. There are no games but work is done while one common conversation takes place. How many are there in your community? Eleven now; and 21 is ideal. First of all, we have had an excellent architect (Riccardo Vincenzino) from the very beginning. At heart, he desires all the things we are striving for, but is prudent too and makes sure we understand the difficulties (and expense) of trying to build an authentic way in today’s building world. Last summer, Neil Rippingale of Scotland - a master stone mason - headed up the building crew in erecting our fist building. It was dedicated on June 27. Then into the fall and winter, our next building was completed: the guest cottage. Built by Brian Post from the Stone Trust, it is a small two-story building that will be used for visiting priests and aspirants. This spring, work begins on our next building. The Recreation and Work Rooms (Vestry) building is 3750 sq. ft, and will be built in the same style as our guest cottage - using only reclaimed wood and structural stone masonry. It is the largest building so far and should take approximately 12 months to finish. The stone masonry will be headed up by a master mason, Justin Money, of Irish Rock Art. Stone masonry begins in May, and excavation is already completed. With minimal plumbing and no electricity, the building will be heated by wood burning stoves and have a rainwater system. The plastered walls will keep the building cool and in the summer, and warm in the winter. 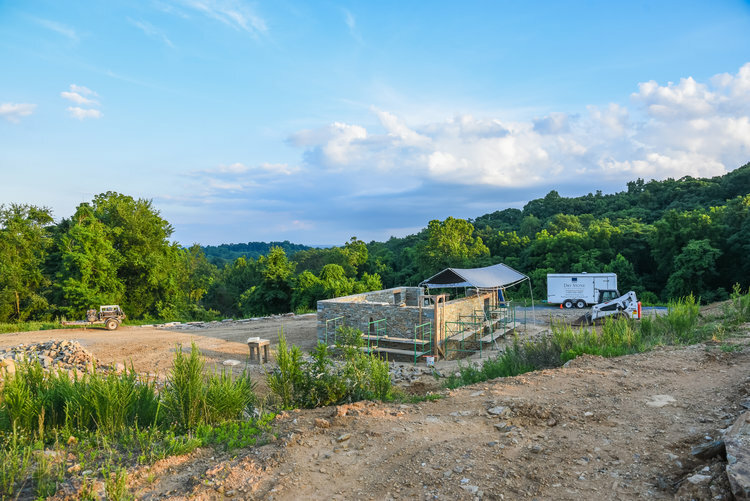 Once the stonework is finished, local craftsmen will hand make the windows and doors, while timber framers will do the roof, and the interior will be completed by Patrick Lemmon, resident Project Manager, and owner of Orthodox Masonry. Floors and fireplaces will be built using Old Carolina Brick - a company which specializes in hand making brick. Each brick is hand molded using the beautiful and lasting traditions of colonial craftsmanship. The roof will be finished with authentic Virginia slate. Once it is finished, we will be able to move out of the barn and trailer and into something much more suitable for living. After this building is completed, plans for 2020 will commence. Here is the original in Avila, Spain.